We just love this back to school John John to match the girl's outfit! 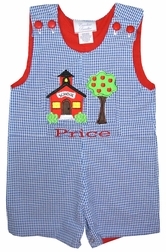 Perfect for the first day of pre-school or any day during the school year. 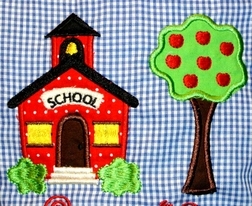 We start with royal blue gingham and style a John John and applique it with a precious school house and apple tree for an apple a day for the teacher! The shoulders fasten with red buttons and the John John is lined with red fabric. Under the school house, you can have your little one's name monogrammed.